He’s been the Mayor for an entire summer, his sister is his personal assistant, his best friend rejoined the army as a sane alternative to prowling the streets as a vigilante, his ex girlfriend is the only one still hanging out with him in the Arrow Cave and she keeps nagging him to make some new friends already. It might be time for Oliver to put some sleeves on his costume and get back to patrolling Star City in Season 5 of Arrow. Season Five: Lian Yu is barely in it, and what is up with Ollie’s hair? Ollie skipped out on Amanda Waller and went to Russia to find the Russian gangster who killed his friends brother. He sets himself up as a bare knuckle boxer to get close to Konstantin Kovar (Dolph Lundgren*) but he’s still far too recognizable and the only way to get in is to work with his former Lian Yu friend Anatoly (David Nykl) to join the Bratva. The Russian mobsters induct Oliver, but it seems he showed up at just about the wrong time because the current leader of the Bratva is in Kovar’s pocket and Anatoly are not so much in agreement. An all Russian Mob Civil War is kicked off, and Oliver debuts his vigilante persona to really strike some terror into the hearts of the Kovar loyalists. Oliver is recruited by Talia Al Ghul (Ra’s more comics accurate daughter played by Lexa Doig) who gives him a quick and dirty version of League of Assassin’s training. Anatoly tries to help Oliver work through his anger and aggression, but Oliver is convinced that he can wear the persona of “The Hood” to do despicable things and then take it off to keep his soul clean as Oliver Queen. After helping Anatoly take out the Kovar loyalists and become the leader of the Bratva –with Kovar seemingly gone for good – Oliver decides it is time for him to go home to Starling City. Anatoly and Oliver go back to Lian Yu and set up an eventual rescue for Oliver, complete with a fake beard and wig to make it look like Ollie has never left the island. One small problem though: Kovar is alive and Kovar has followed Oliver to the island. Oliver manages to kill Kovar just in time to set off a flare that notifies a rescue boat arranged by Anatoly and we finally arrive at the moment the series began five years ago. Oliver is urged by Felicity to take on some new team members to fill the absence of Diggle, Thea, and Laurel. First recruit is Rene Ramirez aka Wild Dog (Rick Gonzalez) a lone street level hero wandering around in a goalie costume; Next up is Evelyn Sharp aka Artemis (Madison McLaughlin) a young girl with almost as much bow skill as Thea; The third new team member is Rory Regan aka Ragman (Joe Dinicol) who possesses mystical rags that give him superhuman powers; rounding out the new team is Curtis Holt aka Mr. Terrific (Echo Kellum) who graduates from tech support for Felicity to full on superhero. A gangster named Tobias Church (Chad Coleman*) arrives in town with the idea of consolidating all the gangs and taking care of Star City’s vigilante problem once and for all, New Team Arrow manage to make short work of him but before he makes it to jail he is killed by a mysterious leather clad archer going by the name Prometheus* (rounding out the badass voiceover trifecta for the CW with Michael Dorn.) Prometheus has some kind of mad on grudge for Oliver and knows his secret identity. After crossing over to The Flash to grouse at Supergirl and fight Aliens: Ollie, Diggle, Thea, and Sara Lance get kidnapped by The Dominators and placed in a virtual reality world where they can live out an alternate version of their lives where Ollie and Sara never got on The Queens Gambit and thus never ended up on Lian Yu. Chase kidnaps Susan Williams and offers her freedom in exchange for Oliver, who of course agrees and gets tortured by Chase for days on end until he is willing to admit the brutal truth of his existence as Green Arrow: he actually enjoys killing people. Once he admits that, Chase just lets him go. Oliver disbands Team Arrow, quits being the Green Arrow and asks the Bratva to come in and take down Chase. Chase gets publicly outed as Prometheus and bolts, Diggle and Felicity try to get Oliver to realize he’s not the brutal killer that Prometheus has convinced him he is. Team Arrow gets back together and manage to capture Chase and turn him over to A.R.G.U.S. It’s all over, except that Chase is still working with Talia who kidnaps the entirety of Team Arrow and will kill them unless Oliver arranges for Chase’s release. Oliver does, and Chase reveals that it isn’t just Team Arrow he has kidnapped – he has another little insurance policy: Oliver’s illegitimate son William. Needing to stop Chase, save his son, and save his friends Oliver asks for the help of a very unlikely team: Malcolm Merlyn, Nyssa Al Ghul, and his greatest friend turned greatest foe: Slade Wilson who claims that the mirakuru formula has left his system completely. The foursome go to Lian Yu for a final showdown with Chase and his team. 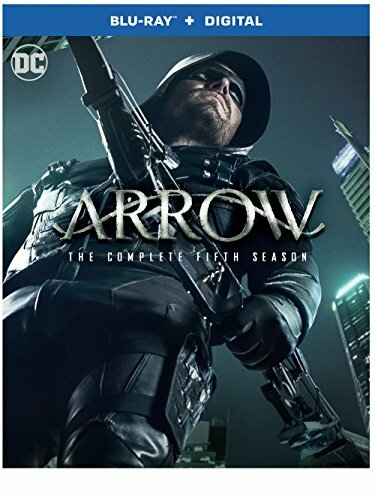 Team Arrow is freed and works on escaping; the Al Ghul sisters get into a serious battle and Slade again proves his friendship to Oliver – but Chase gets away with William. Oliver tracks Chase down to a boat where he reveals he has rigged all of Lian Yu to explode and that Team Arrow cannot get off the island in time. Additionally with a gun to William’s head Chase tells Oliver he has to choose: save his friends and Chase will kill William or save William and his friends will explode. Oliver chooses to save his son and disabled Chase just before a series of massive explosions rip Lian Yu apart. What works about Season five? The street level team approach to the season is a welcome change of pace from previous iterations of Team Arrow and the newcomers really held their own. Rene/Wild Dog is a standout favorite, and the introduction of the Golden Age Black Canary is a treat for comic fans. Speaking of a treat for comic fans, the twist about Prometheus’ identity was brilliantly executed. In the DC comics universe the vigilante known as Vigilante is really a guy named Adrian Chase – with that character roaming around as a brutal anti-hero comic fans expected DA Chase to be the man behind the ski goggles, so when it was revealed that not only was he not Vigilante he was in fact Prometheus it shocked those of us in the know. Josh Segarra’s performance as Chase was charming before the reveal and chilling after. The MVP of the Prometheus/Chase storyline though is Michael Dorn for his superb voicework. This is the second season in which I would say that the flashbacks were a strength of the season, the brilliant David Nykl as Anatoly* really made the Season five flashbacks something special. In just a few episodes Lexa Doig turned her Talia Al Ghul into a wonderful foil for Nyssa Al Ghul, and the return of Manu Bennett as Slade Wilson is the pinnacle of Season five. FINALLY OLIVER HAS A CONSISTENT BEARD. What doesn’t work about Season five? The mystery plot drags on a few episodes too long, even if the reveal is a great twist. Once we learn that Chase is Prometheus, the incredible Michael Dorn soliloquies about how Oliver has failed Star City come to a screeching halt and we never hear his voice again, which is a HUGE loss. Ragman never quite clicked with the audience, neither did Susan Williams. I’m still not entirely sure why the writers refuse to let the character of Laurel Lance go, even after her death – the Earth Two/Villain version of the character isn’t any better than the heroic version of the character and we now have a better version of Black Canary in the form of Dinah Drake. Next Week Dinah Drake vs. Dinah Lance Oliver Queen vs. Ollie Green Arrow vs. Arrow. In Two Weeks: Jefferson Jackson vs. Ronnie Raymond, Captain Cold vs. Leonard Snart, All of Time and Space vs. The Legends of Tomorrow.